Tanzanite is one of the rarest gemstones, making it an unusual, but beautiful choice for engagement jewelry. The gem is available in a wide variety of cuts and can be set in virtually any style of setting. A tanzanite engagement ring is ideal for the woman who has a unique sense of style and who appreciates things of rare beauty. Tanzanite’s popularity is due mostly to its vivid purplish-blue iris hue. Tanzanite is enhanced with heat treatment; unlike many other colored gems, tanzanite survives heat treatment well and heat-treating is considered an acceptable method for bringing out the rich color of the stone. The name “tanzanite” is derived from the only location in which it’s found, the African nation of Tanzania. Discovered in 1967, it’s one of the world’s newest gems. Tanzanite is a special variety of zoisite, but Tiffany and Company decided to rename the new blue zoisite after considering the similarity between the pronunciation of “zoisite” and “suicide.” Far from having a grim history, though, tanzanite is highly prized in its native Tanzania as a token of good luck and prosperity. The gem’s lustrous twilight color is often enhanced with heat treatment, but tanzanite may retain some of its pleochroism. Pleochroic gems are a different hue when seen from different angles; the stone that looks almost a royal purple at one angle may look closer to a sapphire blue from the side. This fascinating play of colors is another reason that tanzanite is highly prized. Although colored gemstones do not have the well-defined standards that diamonds do, tanzanites vary in quality and price. The most expensive tanzanite is a rich indigo color. However, expensive doesn’t always mean best; lighter lavender hues may have more brilliance than deeper shades. Because of its pleochroism, a tanzanite isn’t just one color, so ask to see the stone in different lights if possible. Picking the right color of tanzanite is largely a matter of taste; the right tanzanite is the one that appeals to her. Regardless of its color, a quality tanzanite should be as clear as possible. The clarity of a stone refers to how free of inclusions and flaws it is; higher clarity means more fire in the finished gem. Fortunately, tanzanites naturally have few internal flaws, so finding one that is perfect is easier than with other colored gems. A jeweler’s loupe, the specialized magnifying glass that lapidaries and gem dealers use to examine stones, will reveal how clear a tanzanite is. A darker tanzanite may hide imperfections better than a lighter-hued stone. Look carefully at paler tanzanites as their pastel shades reveal flaws more easily. 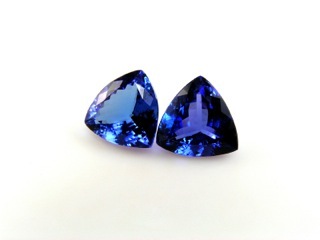 Tanzanites are available in many non-standard shapes as well as more classic gem shapes such as rounds and ovals. The nature of the stone’s crystalline structure lends itself particularly well to trillion (triangular) cuts, marquise (football-like) designs, and teardrop shapes. The carat weight of the stone greatly influences its color. Just as deep water has a darker hue than the shallows, deeper indigo shades are easier to find in larger stones. The converse is also true; lavender tanzanites are generally smaller gems cut to showcase their brilliance as well as their hue. Zoisite and tanzanite are not as hard as some other precious gems. They require a more secure and protective setting to avoid damage to the stone over long wear. Look for multiple sturdy prongs rather than thin ones that may expose the stone’s edges to chipping. A bezel setting is an excellent choice, as the metal wraps around the thickest part of the gem to offer maximal protection. Bezel settings also look clean-lined and contemporary, an elegant complement to an unusual gemstone. Although rarer than diamonds, tanzanite is fortunately not as expensive as its more traditional relative. The price varies widely due to the limited supply of tanzanite, but expect to pay between five hundred to two thousand dollars per carat for a quality gem. The price of tanzanite is determined largely by its color; a clear, dark tanzanite will be at the upper end of the price range while paler gems are usually a less costly option. Gems with striking pleochroism also tend to be a bit more expensive. Factor in the cost of any gems that may be in the chosen setting, too. Tanzanite is even more striking surrounded with diamonds, but an engagement ring embellished with many small diamonds can become as expensive as one with a single large diamond. Reputable jewelers will almost never sell one type of stone as another. However, it’s good to know some of the identifying characteristics of true tanzanite as well as those of possible substitutes. Iolite is a somewhat similar stone, but has less fire than tanzanite. To make matters more confusing, iolite is also a strongly pleochroic gemstone. Genuine tanzanite retains its darker hues regardless of viewing angle, but iolite appears almost colorless when viewed from the side. Iolite is a less expensive gem; although beautiful in its own right, there’s no need to pay tanzanite prices for iolite gems. Always buy from a trusted jeweler. Less expensive blue sapphires are occasionally mistaken for tanzanite as well. Sapphires lack the purplish cast that tanzanites have and exhibit no pleochroism; they are sapphire blue regardless of lighting or angle. Sapphire often has inclusions and cloudiness while tanzanite rarely does; in fact, a flawless sapphire is rare enough to be quite expensive and therefore unlikely to be sold as a substitute for tanzanite. Tanzanique is a synthetic form of tanzanite. It’s a colorful variation on cubic zirconium, but is easily identifiable from genuine tanzanite as its fire is identical to any other CZ, albeit with a different hue to the stone. A softer gemstone like tanzanite requires special care. Ultrasonic cleaners and harsher chemicals that work well for sturdy diamonds, rubies, and sapphires aren’t meant for tanzanite. Clean tanzanite engagement rings only with soft cloths and brushes. Because of their sensitivity to heat, a tanzanite ring can present a problem if repairs are needed. It’s best to return a tanzanite ring to a skilled jeweler to have prongs re-tipped or for resizing. Reputable jewelers are aware of the more delicate nature of these rare stones. While it’s true that tanzanites are more fragile than diamonds, it’s equally true that every other gemstone is as well. Their softness is only relative, so have no fear of buying a ring too fragile to wear. Tanzanites are strong enough to last a lifetime if properly cared for and set in a mounting that affords them some extra protection.